Once you have invested your hard earned money into what you have determined to be the best air rifle for your needs the last thing you want to do is neglect it. No matter if you are a collector or a shooter the most important thing to keeping your gun in its best possible shape is to keep it clean. Many new users make the mistake of thinking that since air rifles do not use actual bullets that they don’t need to be cleaned like regular rifles do. The truth is, if you want to keep your air rifle in good working order, you will need to clean it on a regular basis. By cleaning your air rifle on a regular basis you are going to ensure that it is always functionality, plus it will remain easier to use since it is being properly taken care of. However, if you are new to the air rifle world cleaning it can be a bit overwhelming. To help ease into things here are our top 10 tips for cleaning your air rifle. One of the best tips we can give you in terms of cleaning your air rifle is to make sure you purchase a good cleaning kit. Don’t fall for the myth that all cleaning kits are the same because sadly they are not. When looking for a good cleaning kit you need to pay close attention to what is inside of it. The better cleaning kits will come with majority of the tools that you need to properly clean your air rifle. However, you might still have to purchase additional parts from retailers to ensure your air rifle is properly cleaned. The basic tools that your better cleaning kits need to include are patches, oil, brush, cleaning rod, and pellets. Sure having a good cleaning kit helps you keep your air rifle properly maintained, but it is not the only way to clean your air rifle. If you don’t happen to have a good cleaning kit on hand or perhaps you have one on back order, but still need to clean your air rifle there are ways you can do it with stuff you have around the house. Using a piece of string and a wet rag you can easily clean the inside of the barrel. To do so break open the barrel, slide the string through, tie the wet rag onto one end of the string, and slowly pull the string from the other side so the rag slides through the barrel. If the barrel is wet inside after running the rag through it simply let it air dry or run a dry rag through it. If debris is left behind use a different rag that doesn’t leave behind lint, such as a microfiber cloth. The worst thing that you can use to clean the inside of your barrel is water. Using water soaked rag can cause rust to form on the inside of the barrel. When using a wet rag to clean the inside of the barrel you will want to use a something that is a quick drying solvent, such as rubbing alcohol. Before running the rag through the barrel you will want to soak out any excess solvent. If possible this is the recommended way to clean your air rifle. When using cleaning pellets make sure they are made from felt and insert two of them into the barrel chamber. When buying cleaning pellets make sure they are the right size for your barrel. The pellets should be pushed through using a cleaning rod. The barrel should be cleaned with a pellet after every 100 rounds. Every time you fire about 1,000 rounds you are going to need to lubricate the seals with a high flash point lubricant. The piston seal, which is located inside the compression chamber requires two drops of the lubricant. The breech seal, which is at the back of the barrel, needs only a single drop. The breech seal can only be accessed with the chamber open. Now obviously you are going to use spring cylinder oil to oil the main spring. The main spring is near the barrel of the air rifle, but should not be oiled unless the chamber or barrel is closed. Access is usually obtained via the underside of the forestock, although some air rifles require you to break down the entire rifle. Once the main spring is exposed apply about six drops of oil. All other moving parts of the air rifle should be oiled with one drop of oil to keep the parts moving freely. Oiling the spring and other moving parts should be done after every 1,000 rounds that are fired. Cleaning the outside of the air rifle is just as important as cleaning the inside. 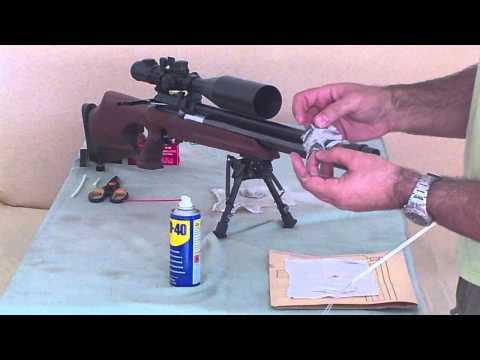 Al metal parts of the air rifle should be cleaned with a soft cloth that will not leave behind any type of debris and a good degreaser, preferably one that is designed for gun barrels. Some people are concerned about suing cleaning rods inside of an air rifle barrel because they are worried that the rod will mess up the rifling or even the crown of the air rifle. To solve this problem you can make your own cleaning rod out of .080 weed whacker cord. To make the cleaning rod you will need to cut one end at an angle so you can secure the cleaning pad to the rod. The other end can be melted and filed to form a pad that is the exact size of the air rifle’s bore. If your air rifle happens to have a muzzle break on it, cleaning everything properly can seem a bit overwhelming. Guiding the line into the barrel is not as easy as it sounds with a muzzle break. To solve this problem all one needs to do is use a straw inserted to the barrel, which will allow you to feed the line through quite easily. Cleaning your air rifle doesn’t need to involve a bunch of fancy chemicals. Goo Gone is a very affordable alternative that you can use to safely clean the inside of your air rifle. One of the great things about using Goo Gone is that it will not damage any of the seals nor will it detonate if you use it to clean the barrel. When using Goo Gone simply squirt some onto a patch and run it through the air rifle barrel with your rod of choice, wooden dowels, weed eater string, etc. Once you are done with the Goo Gone run several dry patches through the air rifle barrel to remove all excess traces of the Goo Gone.